Omega 3’s…Omega 6’s…now Omega 9’s? They’re not as commonly discussed as the 3’s and 6’s, but you will occasionally see Omega-9 fats listed on a supplement (like fish oil) or a health claim on a label. But the good news is that they’re not necessarily something you need to worry much about. All fats are basically long chains of carbon, hydrogen, and oxygen, joined with molecular bonds. Think of them like necklaces made of beads on a string. Saturated fats have a strong string (strong single bonds) for the entire necklace. Monounsaturated fats have just one week patch (one double bond, which is less chemically stable) in the string, making them more vulnerable to breaking. Polyunsaturated fats have more than one weak patch (many unstable double bonds), making them fragile and very vulnerable to breaking. The “Omegas” are all types of unsaturated fats, meaning that they all have at least one “weak patch” in the string. Omega-6 fats are also polyunsaturated, with their first weak patch just after the sixth bead. Omega-9 fats are either monounsaturated or polyunsaturated (more on this in a minute), and have their first weak patch just after the ninth bead. This doesn’t tell you much in practical terms, though. 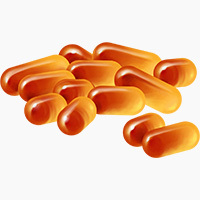 You know that Omega-3’s are anti-inflammatory and beneficial, while Omega-6’s are inflammatory and best limited. But what about Omega-9’s? Unlike the 3’s and 6’s, Omega-9 fats are not “essential” fatty acids. That means that you don’t need to get them in your diet – if your body needs them, it can make its own. With Omega-3s, you have to get them from food, but with Omega-9s, healthy people have all the equipment to make their own in-house. That doesn’t necessarily mean that eating them is bad for you though, so let’s take a closer look. Within the general group of “Omega-9 fats” are several individual fatty acids. Oleic acid: a monounsaturated fat found in olive oil, macadamia oil, poultry fat, and lard. It’s been studied as the fat behind the unique health benefits of olive oil, but this has never been conclusively proven. Mead acid: a polyunsaturated fat that may have some anti-inflammatory properties. Erucic acid: a monounsaturated fat that has raised some concern based on animal studies that this may be dangerous to humans. That’s not an issue on Paleo though, since it’s mainly found in canola oil and mustard oil – both industrial seed oils that aren’t Paleo anyway. Nervonic acid: a monounsaturated fat important for healthy brain function. It’s found in salmon, nuts (especially macadamias), and seeds. The only one of these with any significant research relevant to human health is oleic acid – as the staple fat of the “Mediterranean Diet,” it’s definitely in vogue right now. Even so, the research isn’t conclusive. This review discusses the potential health benefits, most notably for strengthening the immune system and reducing inflammation. Specifically, oleic acid has been studied for inflammatory diseases like arthritis. Oleic acid is also promising for improving cardiovascular health, although of course all this research is done with the single-minded goal of lowering cholesterol, which may not be the most useful endpoint to focus on. The short version: we think there’s something exciting there, but we’re not quite sure how it works yet. Regarding the other Omega-9s, there’s also a handful of other studies in animals and test tubes – this one, for example, that found an Omega-9 rich oil to be protective against breast cancer in mice. This one suggested (again, in mice) that if mothers eat a diet high in Omega-9 fats, it may help protect the baby from fatty liver disease. But all of this is very experimental and it’s very possible that it doesn’t work the same way in humans as in mice. Overall, Omega-9 fats (with the possible exception of erucic acid) seem to be perfectly healthy, if nothing particularly amazing. There’s nothing wrong with them, and many of the foods that provide them (for example, salmon and olive oil) are very nutritious and deserve a place on your plate anyway. Almost certainly not. The only time you might benefit from an Omega-9 supplement is if you were seriously deficient in both Omega-6 and Omega-3 fats, and had no way to get them through diet. Since that’s a vanishingly rare situation, chances are excellent that an Omega-9 supplement is just a waste of money. Don’t pay any attention to the bottles screaming about their “Omega-9 content!” – it’s just an attempt to impress you with scientific-sounding words, and make you worried about something you never needed to worry about. And “Omega 3-6-9” supplements are just silly: Omega-6 fats are inflammatory and already far too prevalent in the modern diet; why would you ever supplement with them? What About the Other Omegas? Just when you thought it couldn’t get any more complicated…it did! If you really dig into it, you’ll find that 3, 6, and 9 are just the beginning: there are also Omega-5 and Omega-7 fats – but don’t stress about them. Most of them you can synthesize yourself from various saturated fats. And even if you couldn’t, they’re common in foods like fish, nuts, and seeds: the same foods that contain the other Omegas. Omega-9 fats are really more interesting for the health nerd cred and general knowledge than anything else. Oleic acid (the Omega-9 found in olive oil) may possibly have some health benefits; the others get a lot murkier, since there hasn’t been much research that wasn’t done in mice or test tubes. If you eat plenty of seafood and enough healthy saturated animal fat, you’ll automatically get all the fatty acids you need, both the essential and the non-essential. There’s no need to eat any specific food just for the sake of getting Omega-9s. And don’t spend even a minute worrying about “Omega 3-5-6-7-9” supplements!